My stitching for this week's TAST task. I always know when I'm seeing excellent work when it makes me want to run for my needle and thread and work myself! this whole series of variations on the running chain really works so well together, colors harmonized, shapes happy together! this is really lovely. Thank you for your compliment, Boud. Wow! Very beautiful. I love all of your variations. deine stitch exploration ist super, da kann man nur lernen. Toll, wie du die verschieden dicken Fäden einsetzt! Den Kreuzstich kann ich schon gar nicht leiden! This is a really great sampler! Very nice, Raphaela. So many different looks for the same stitch! Nice exploration. I like all the colors you chose for your well-done chain stitching. Your work never disappoints Raphaela, this sampler is a lovely example of the running chain stitch. 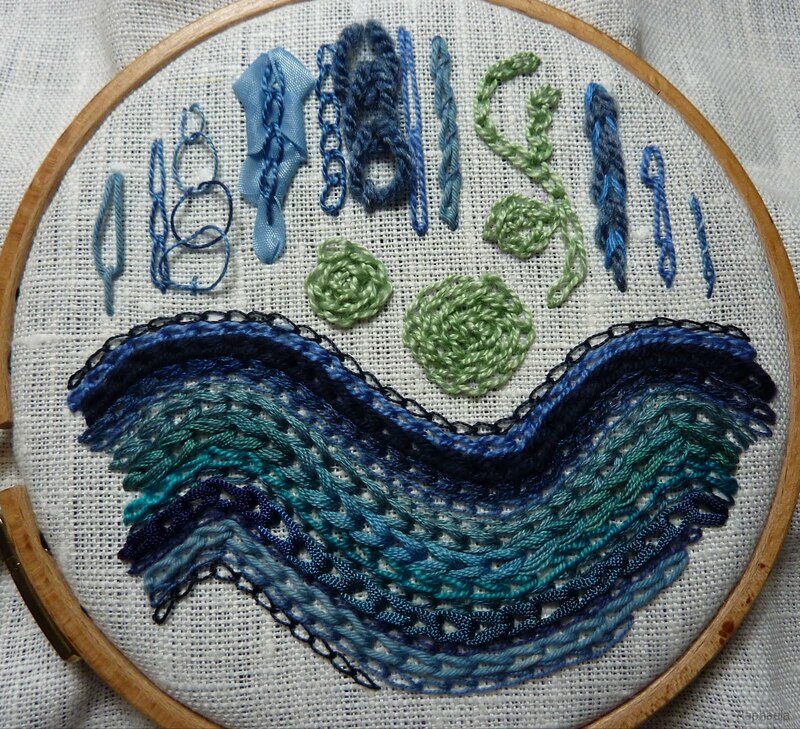 I love the variety of threads you've used to create chain wave.Have never seen them before.Are they embroidery threads? Love the variations and the colours ! Interesting with all these different threads! What an elegant sampler! I love the colours and the mixture of threads. Das gefällt mir, ein schönes Wellenbild. Deepa, most of the threads are embroidery threads: cottons and silks, one- and mutiple-stranded, some knitting yarns, a polyester ribbon and a thicker sewing thread that my old sewing machine refused to accept - so the thread went into my embroidery thread stash. Very pretty! The bottom part looks like beautiful waves. Lovely work, and in my favorite colors!